I hope you had a good Monday at school, I have slept and worked and found a new horse, but I am going to keep riding in the same direction. Going back to Merleau Ponty’s statement, I think we can now agree that Vincent was possessed by the unspectacular corner of a wheatfield with its incumbent crows in Auvers Sur Oise and in turn he owned it. The corner of this particular wheatfield had been subject of several interventions, not least by the sower of the wheat, Vincent as Millet, was familiar with the sower and the religious connotations of the sower. I own seven photographs of a playground that has been subject to innumerable interventions. The first intervention, believe it as you may, was in Genesis Chapter 1 verses 11 to 13. So now I am familiar with the tree and the religious connotations of the tree, so as a starting point, I am not far away from Vincent, or Millet or even Pissarro. All I need do now is dance at the easel. 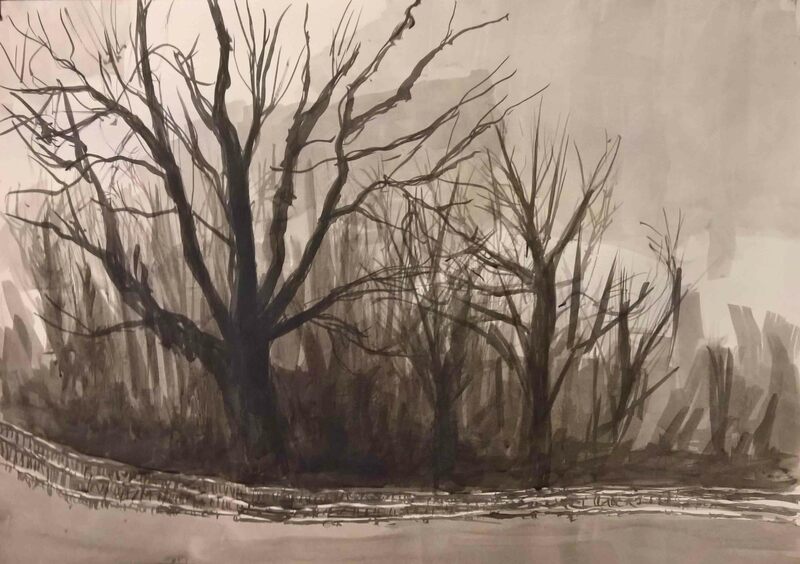 It doesn’t really look like the photographs because I drew it from memory which is, I suppose, one way of possessing a landscape and making it your own and interacting with it.